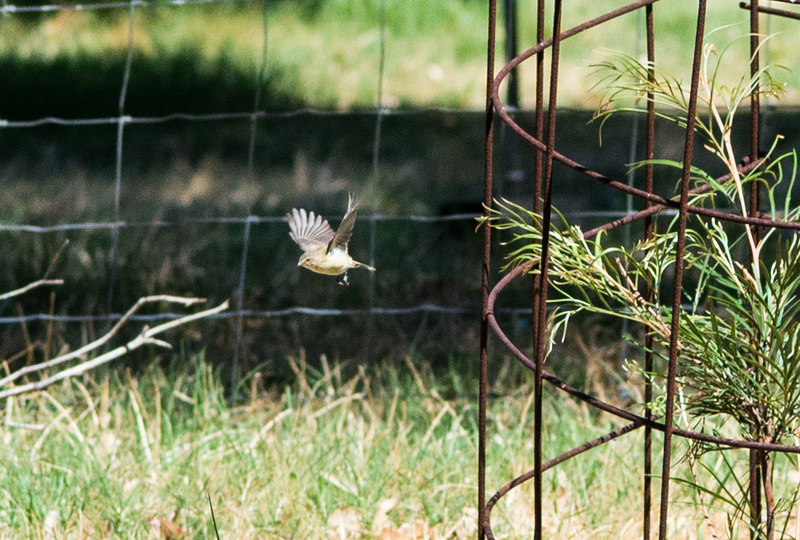 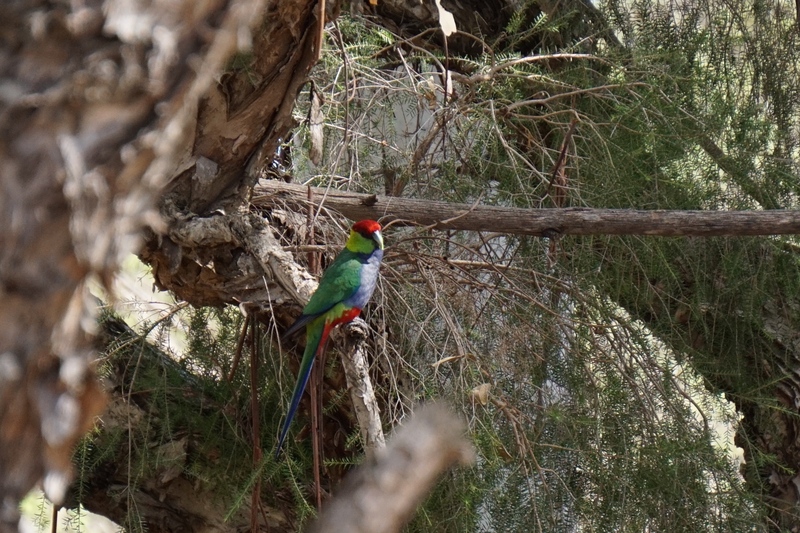 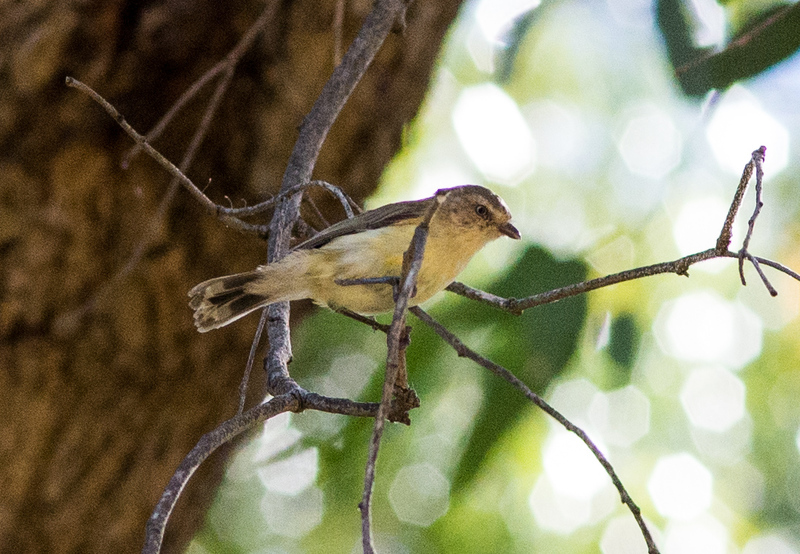 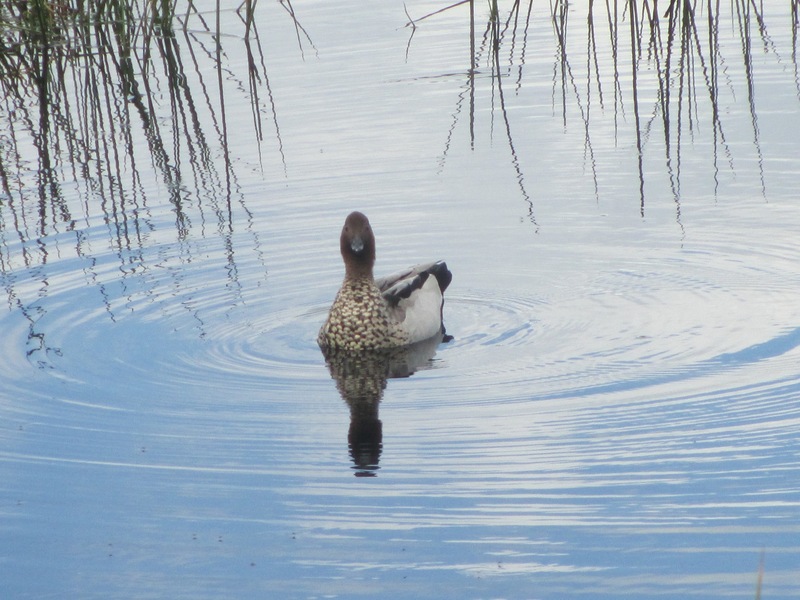 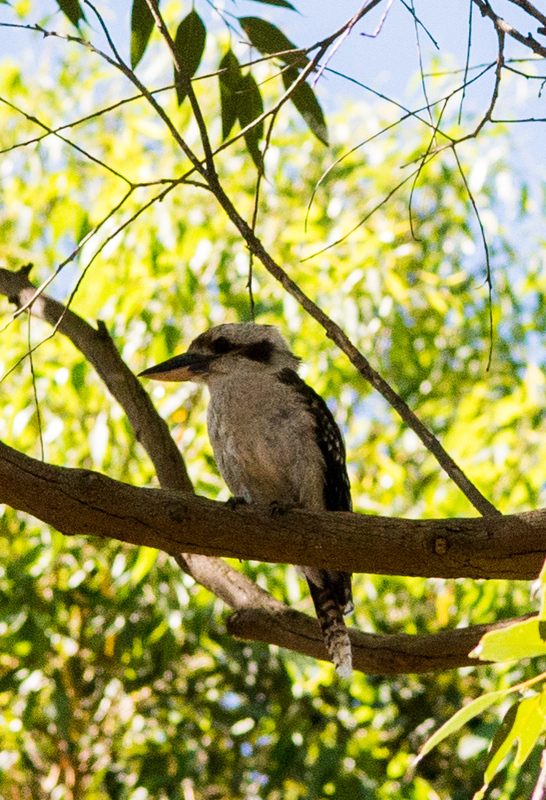 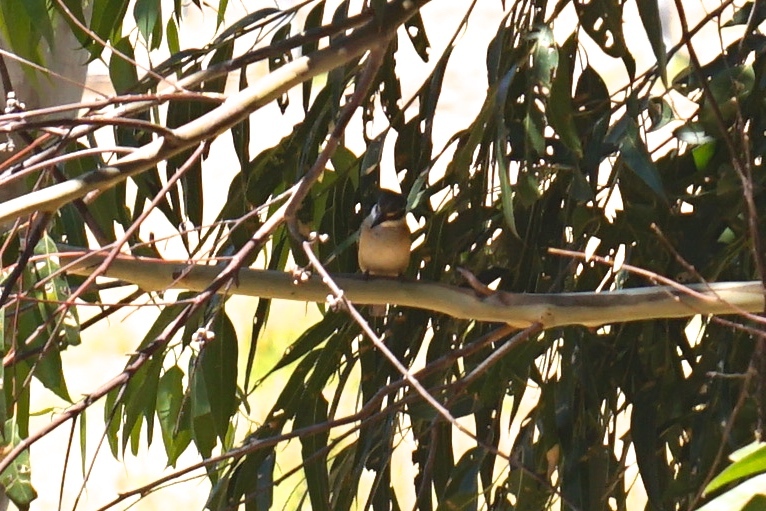 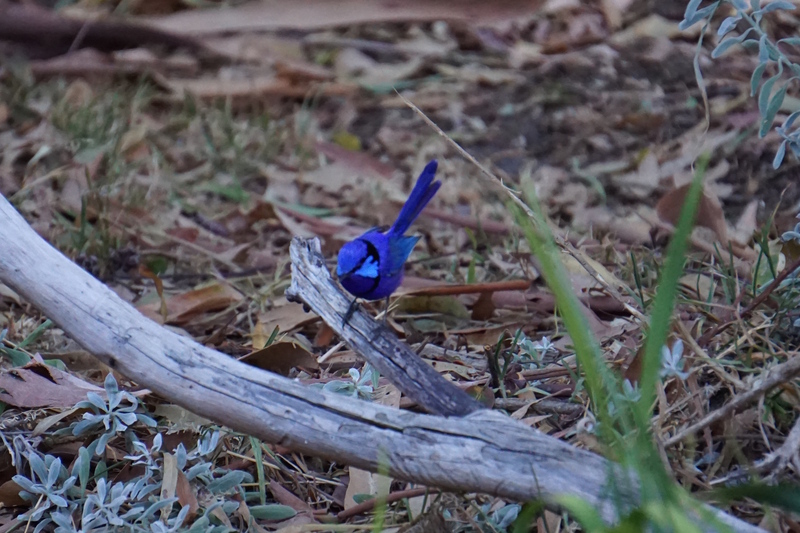 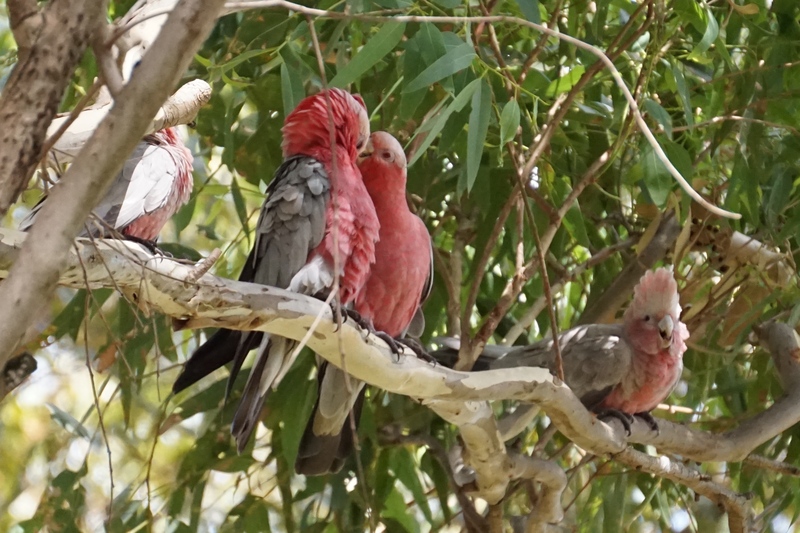 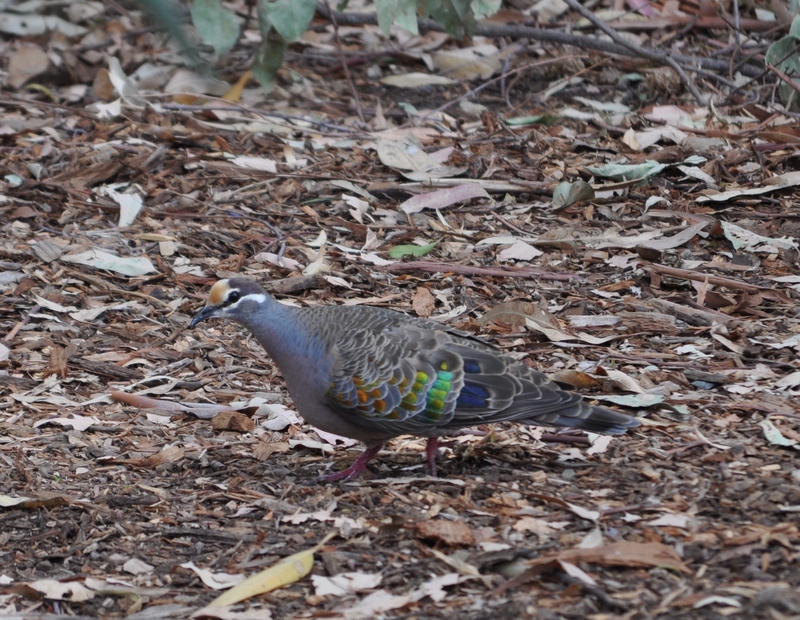 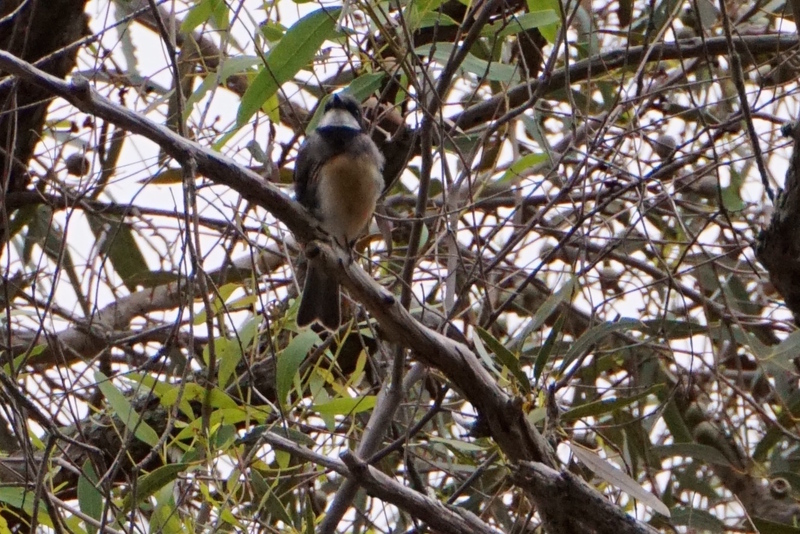 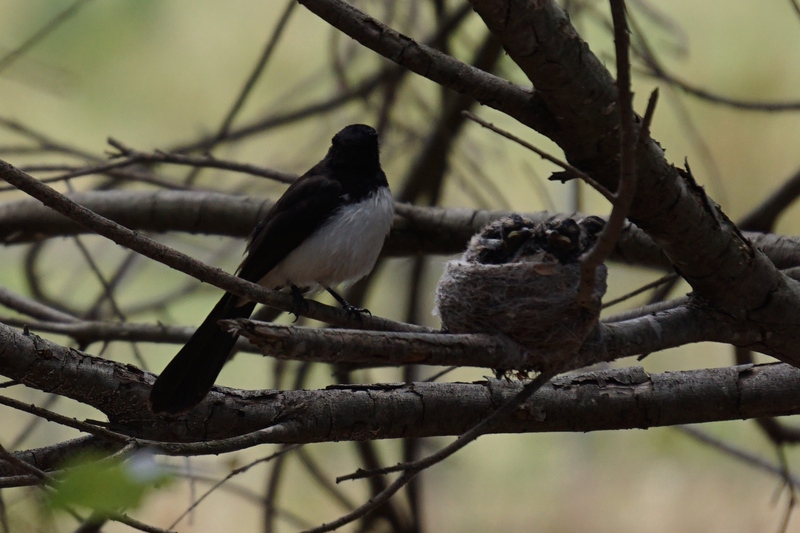 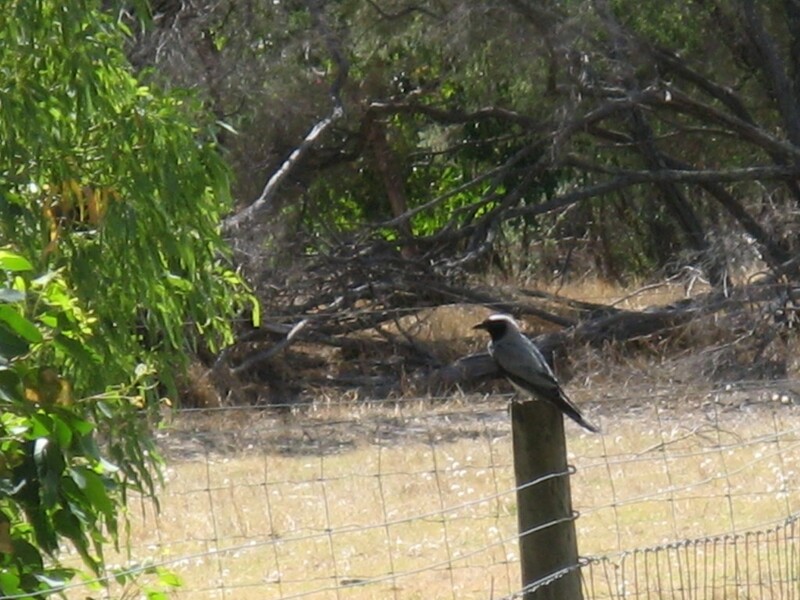 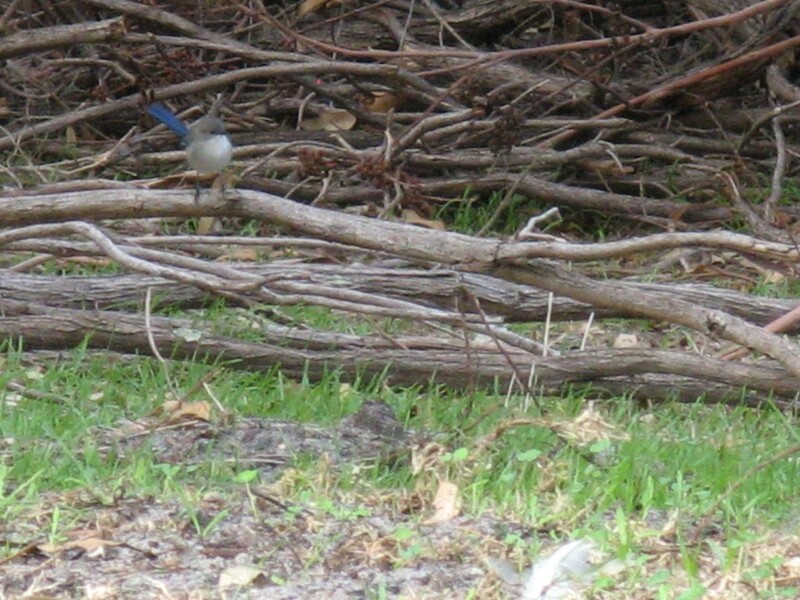 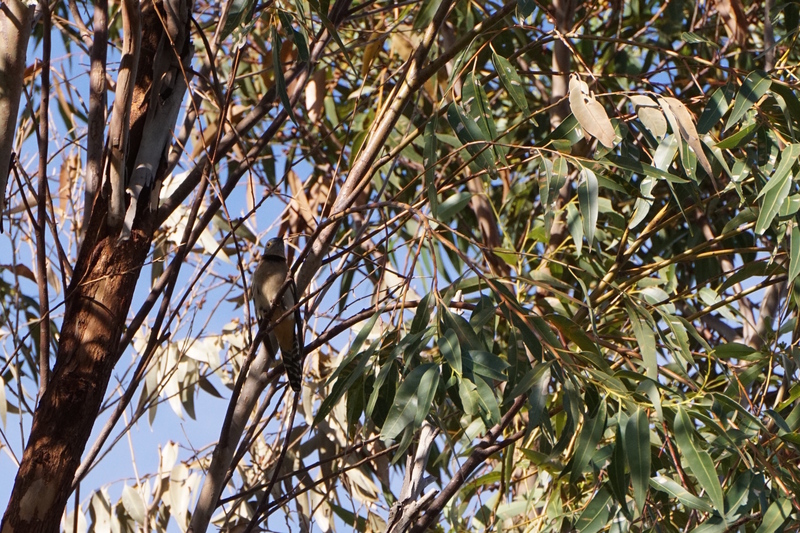 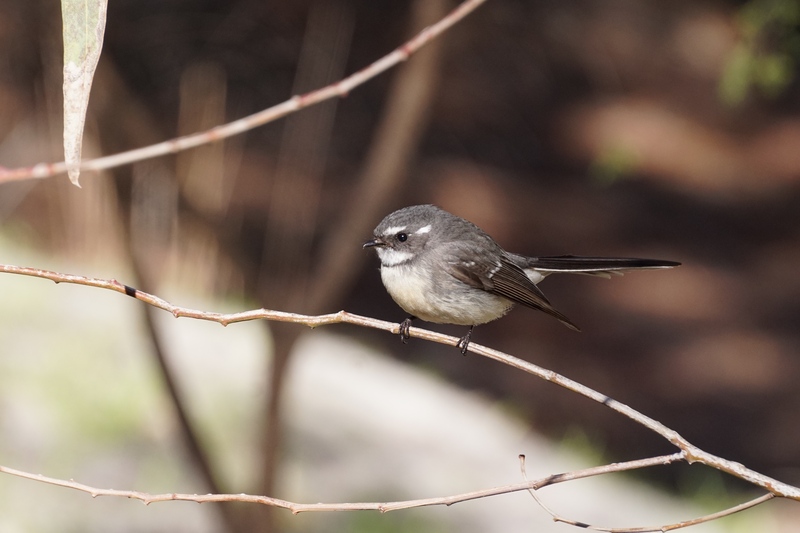 It is great to see so many native birds on our property. 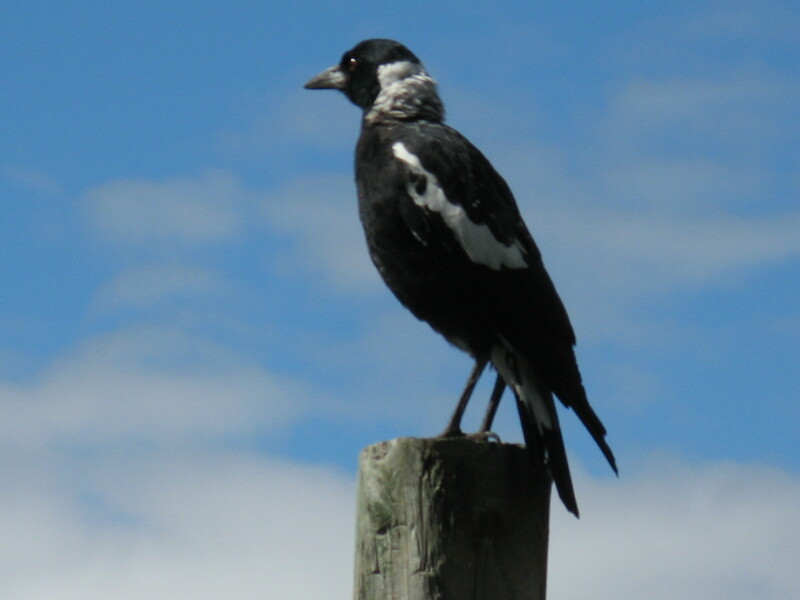 Some are common, others a bit less likely to be seen in a suburban block. 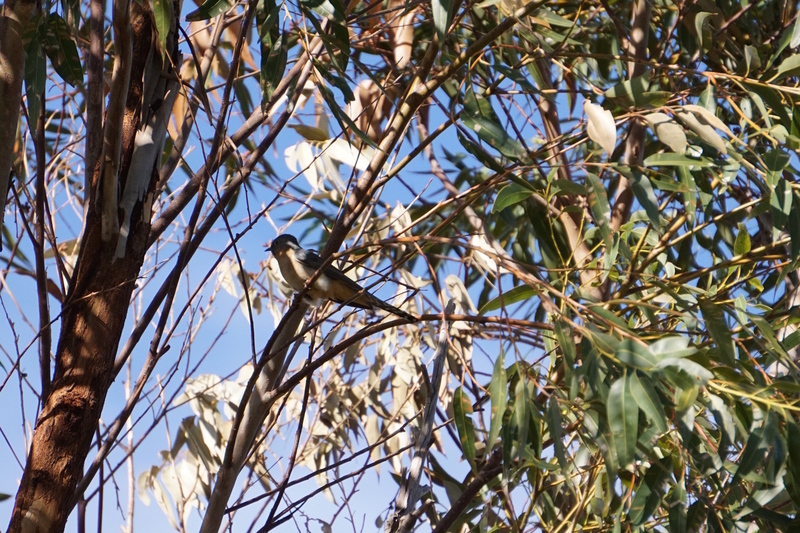 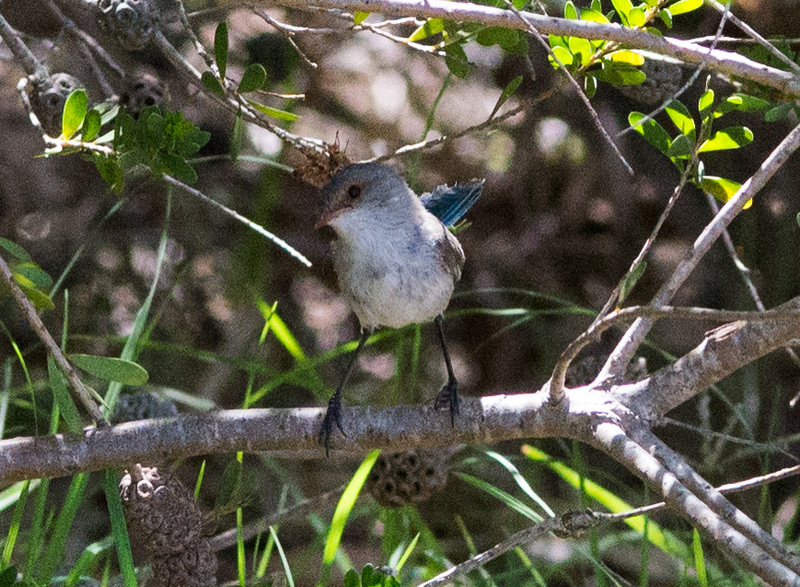 We have planted so many trees over the years that we are seeing some of these birds more and more often now. 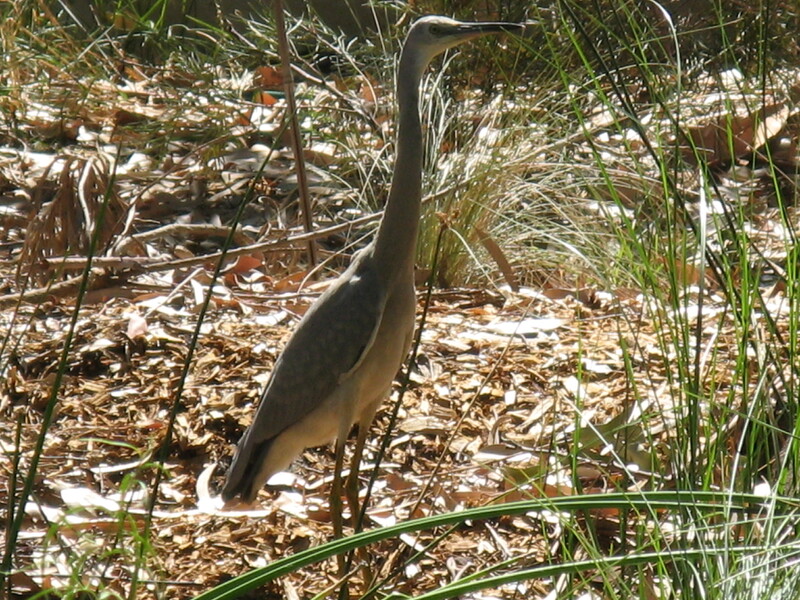 Some of the visiting birds have wreaked havoc, like the Heron and Little Bittern, who on separate occasions killed or ate every koi and goldfish from the outdoor ponds as well as piercing the plastic liner! 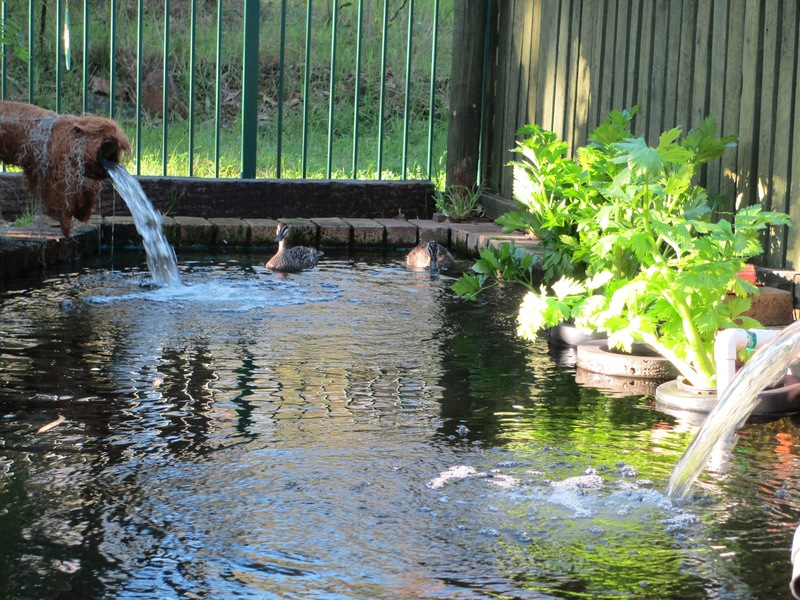 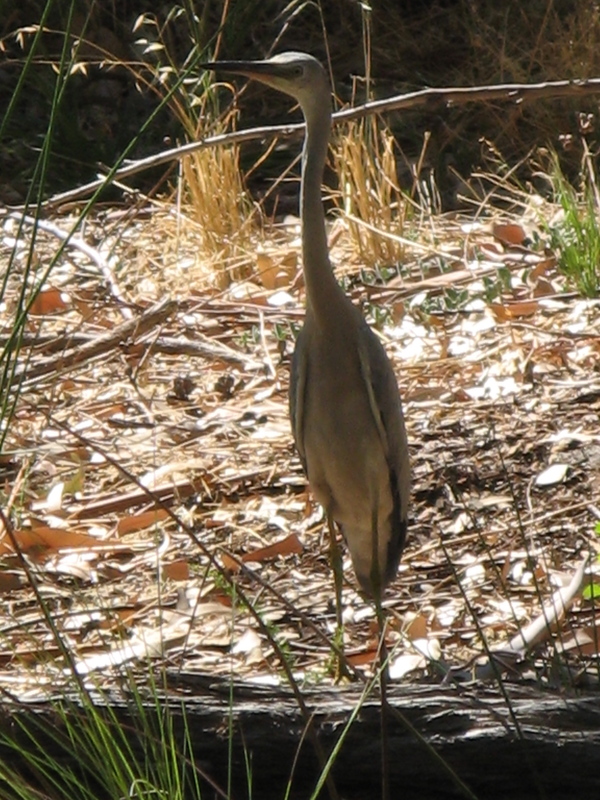 While we are pleased to see native birds, we would actually prefer the heron to leave our fish alone! 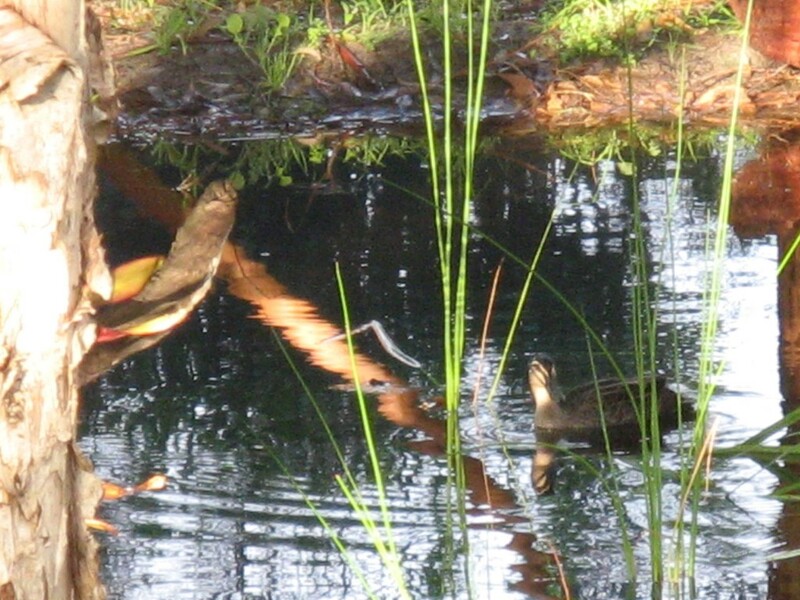 How many fish can I spear? 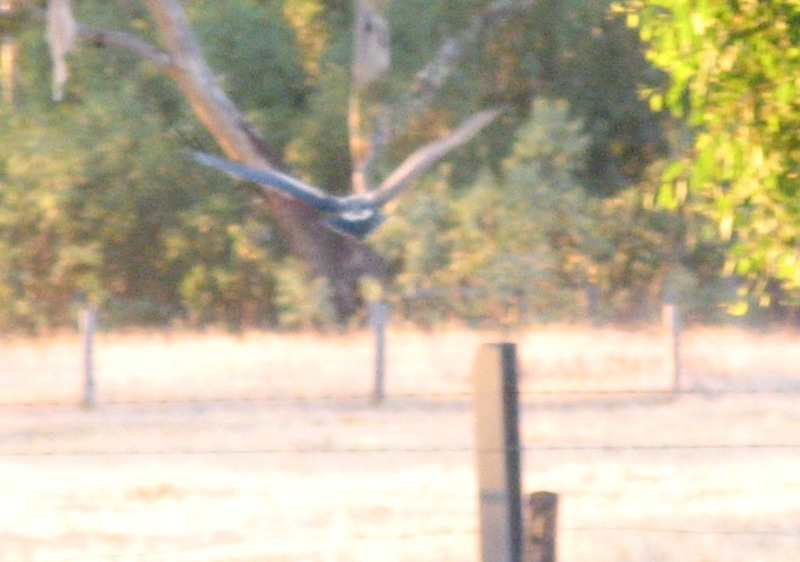 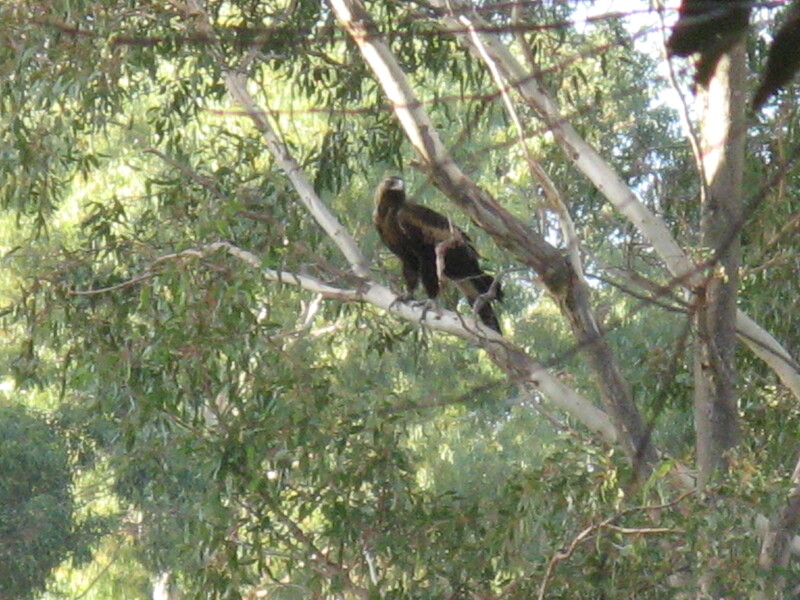 Equally as wonderful, but also destructive, are the Wedge-tailed Eagles which have caused concern now and then as they look for an easy dinner. 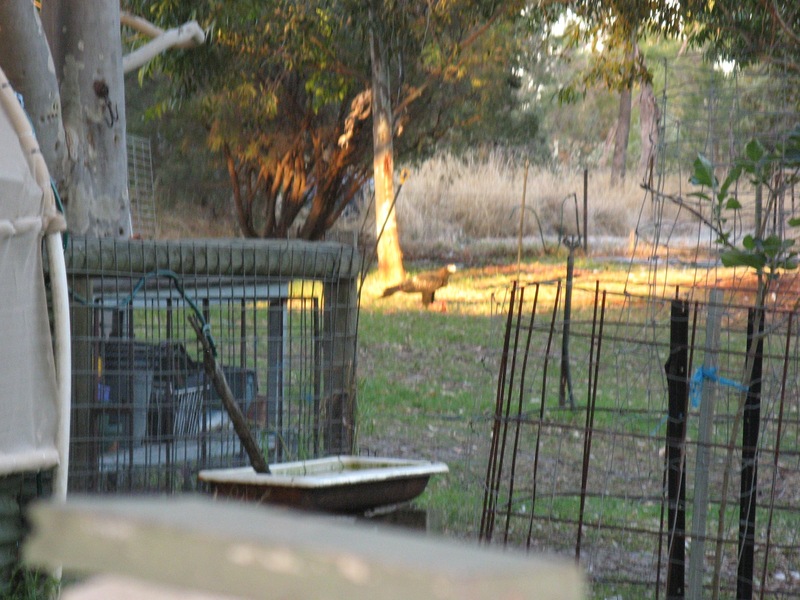 This one killed and ate a duck and the rooster before we realised what was causing the deaths and kept the poultry in their pens for a while! 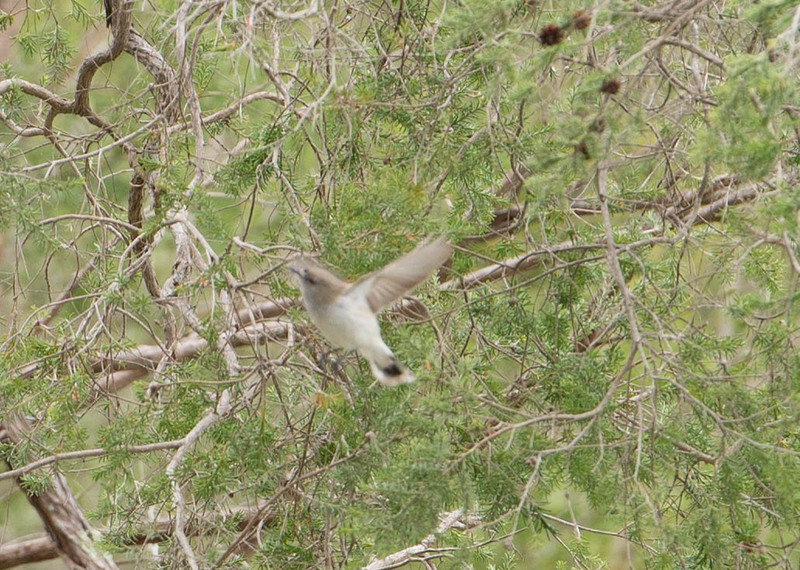 We hear the very elusive Fan-tailed cuckoo, but very rarely see it! 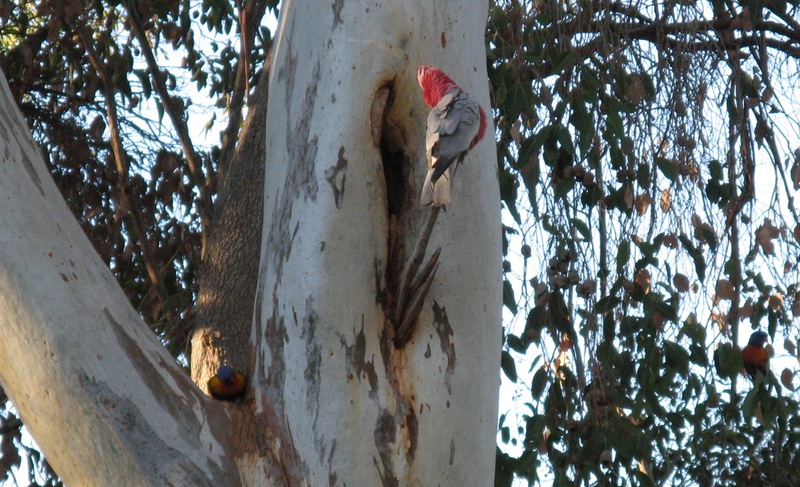 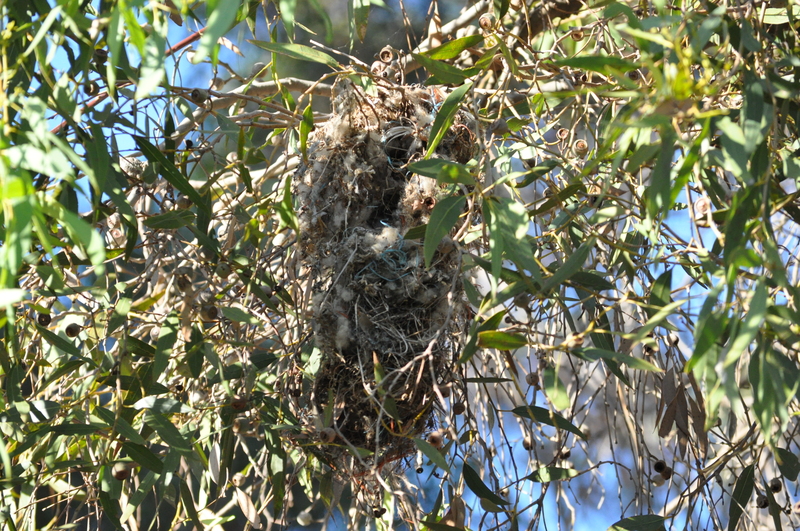 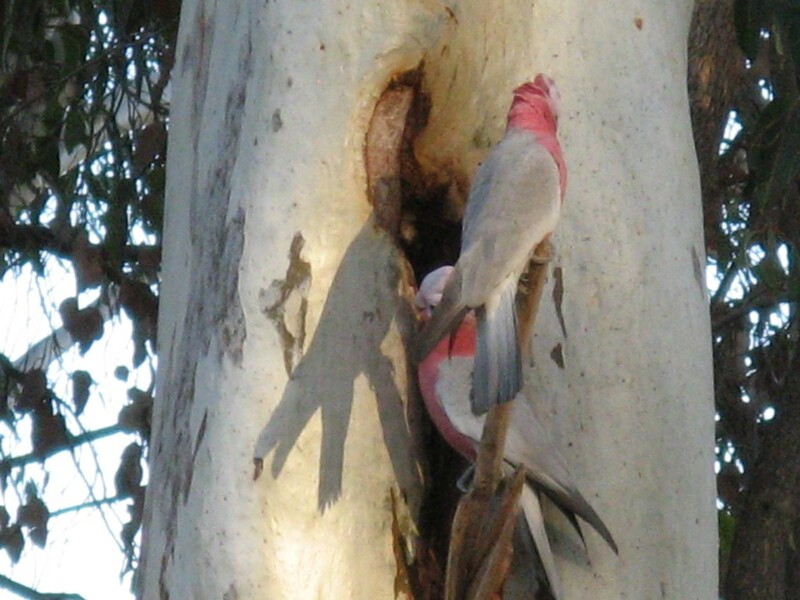 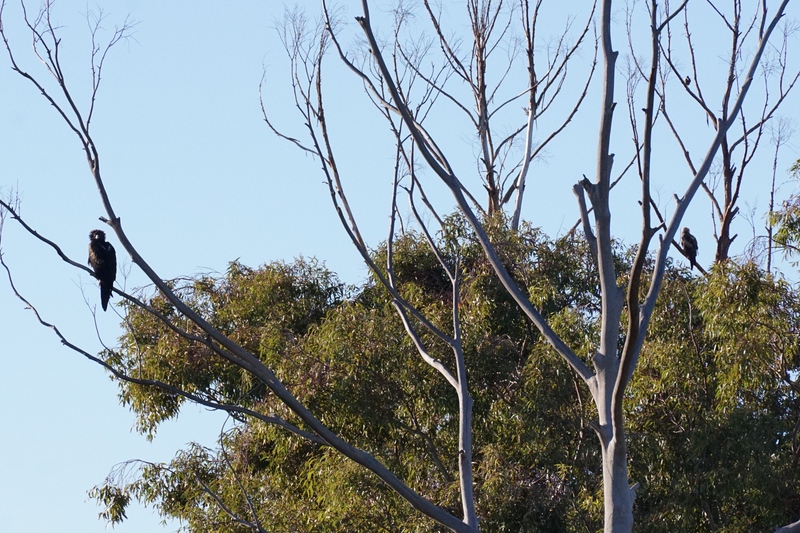 A pair of galahs nested in a hole in this tree for the last two years. 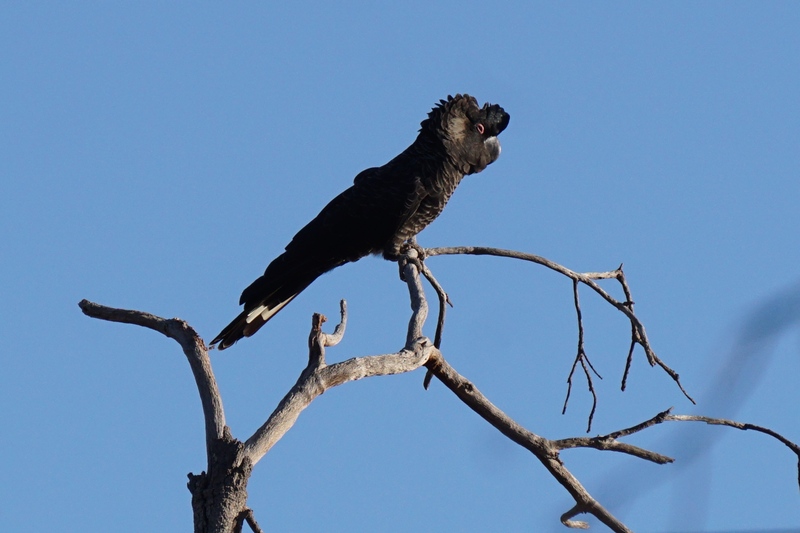 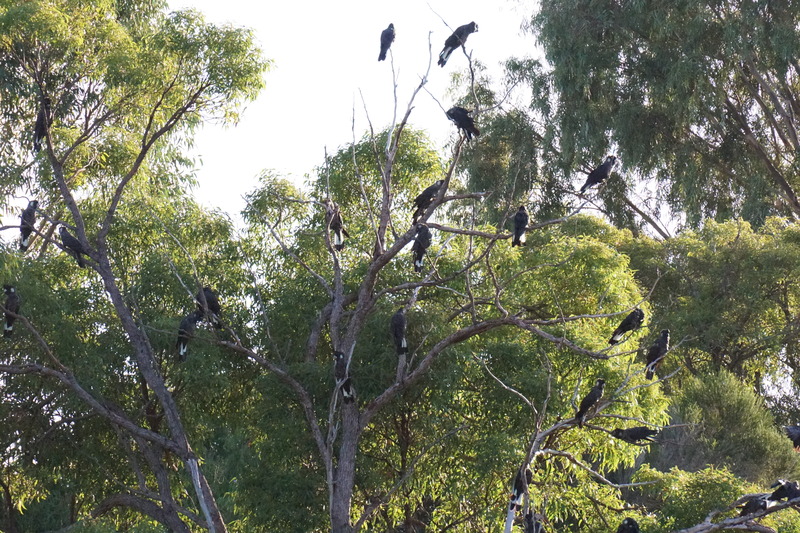 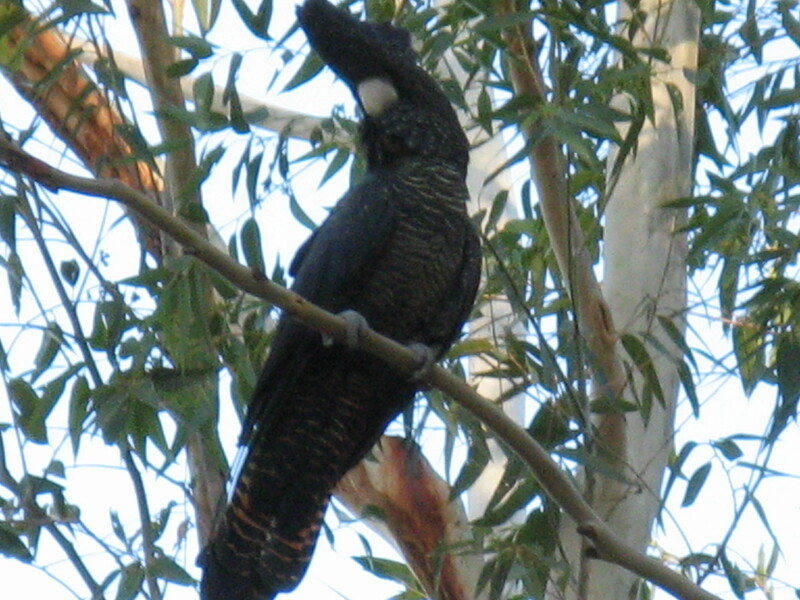 It is always exciting when the cockatoos come to visit, whether those with white tails or these, the Red-tailed Black Cockatoo. 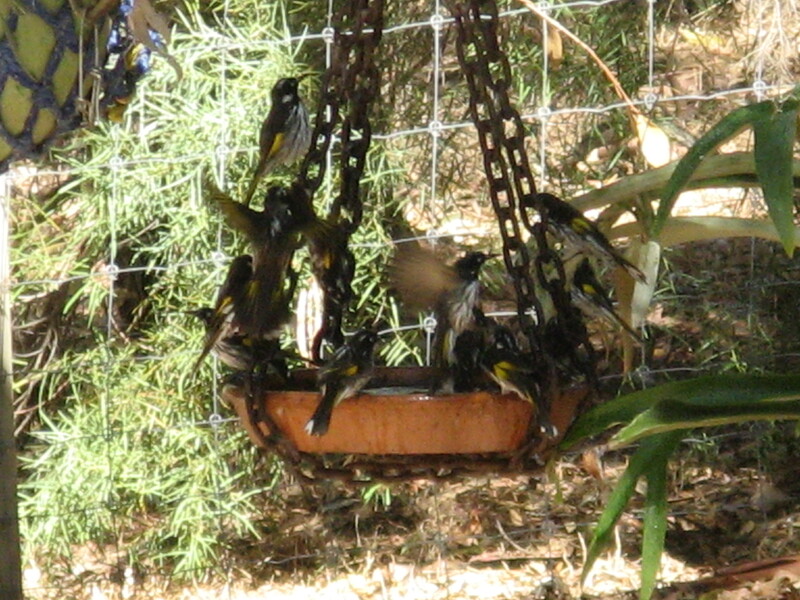 They make a lot of noise, eat the honky-nuts (and make a big mess in the process), and often stay over night. 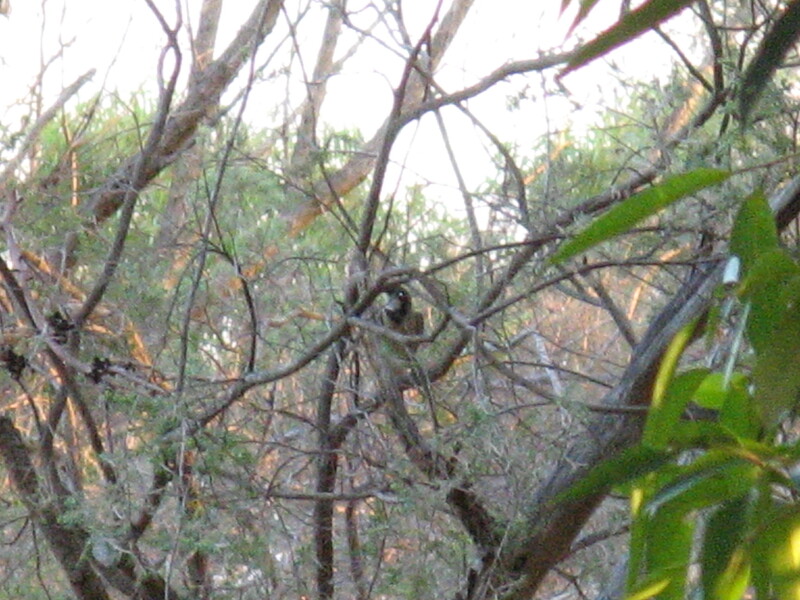 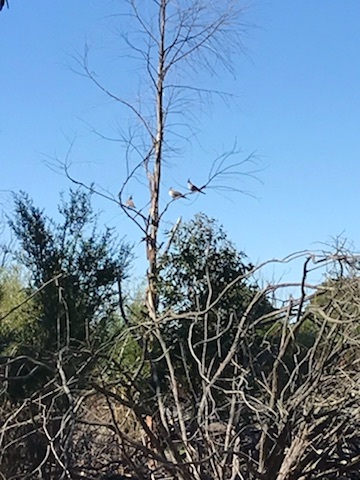 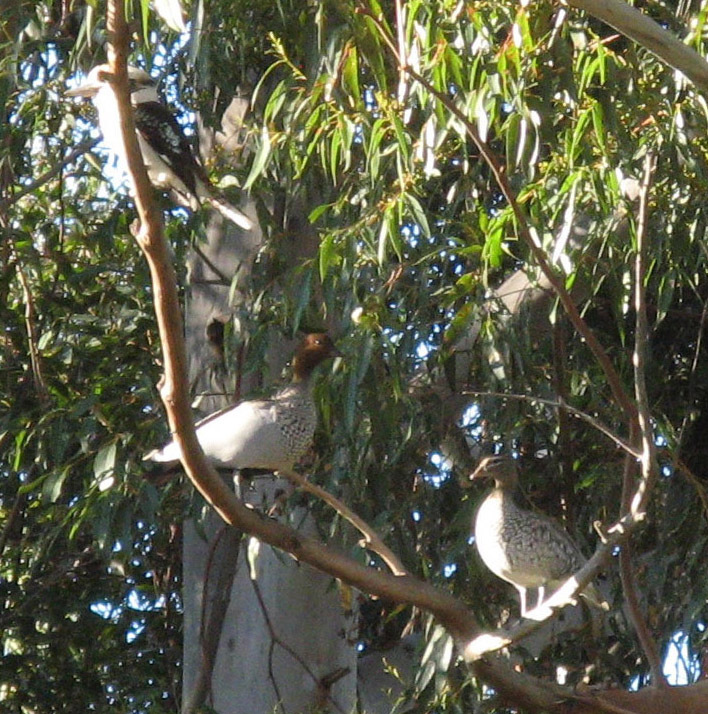 Australian Wood duck pair high in a tree with a kookaburra! 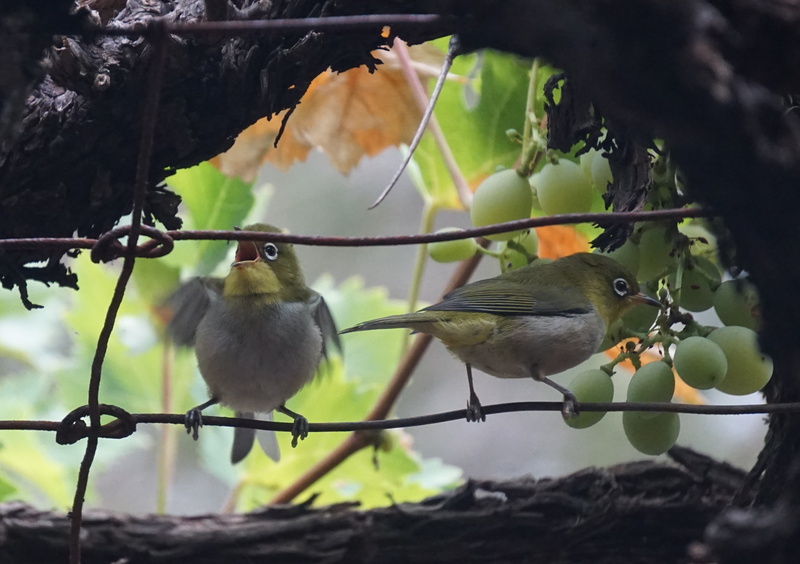 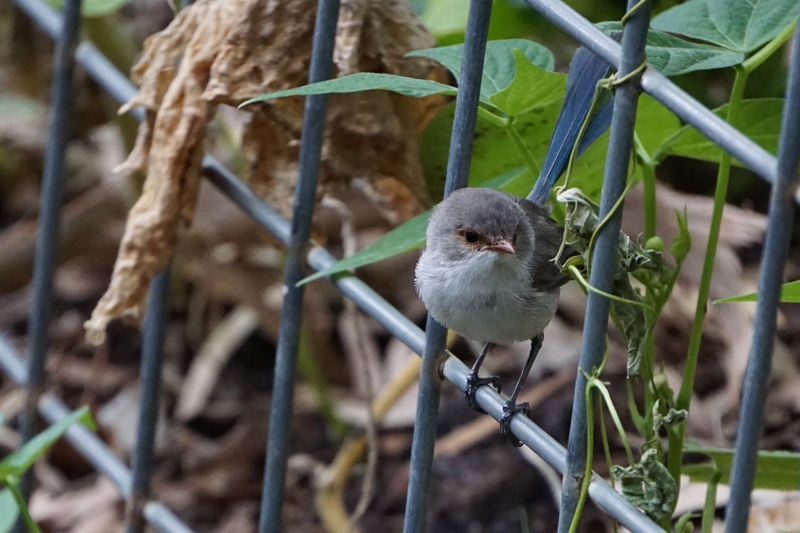 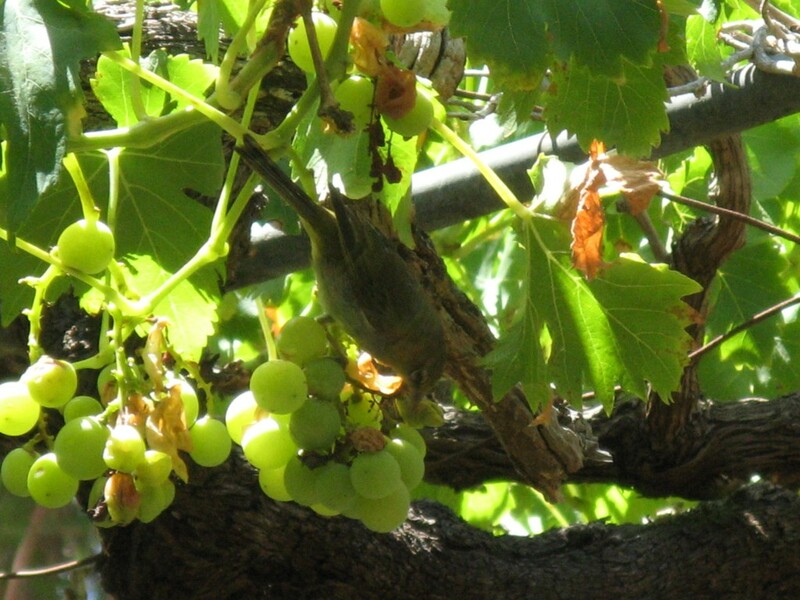 Even the lovely little Silver-eyes soon destroy a nice bunch of grapes if they aren’t netted! 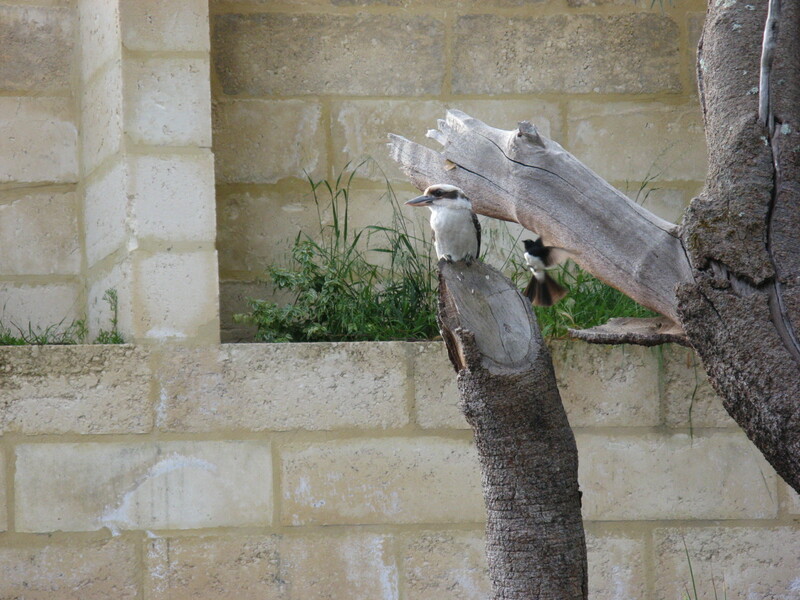 Kookaburra calmly watching the fish in the ‘billabong’ while being harassed by two willy wagtails! 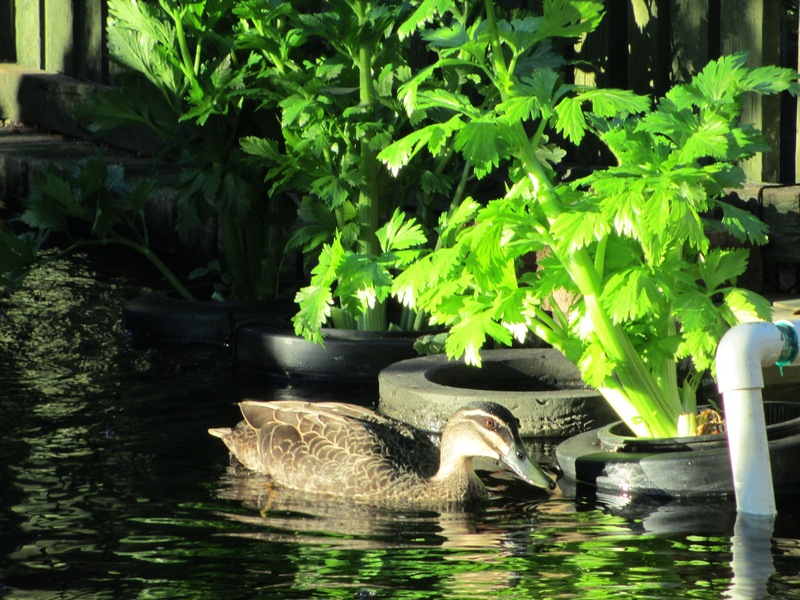 Pacific Black duck in the swimming pool! 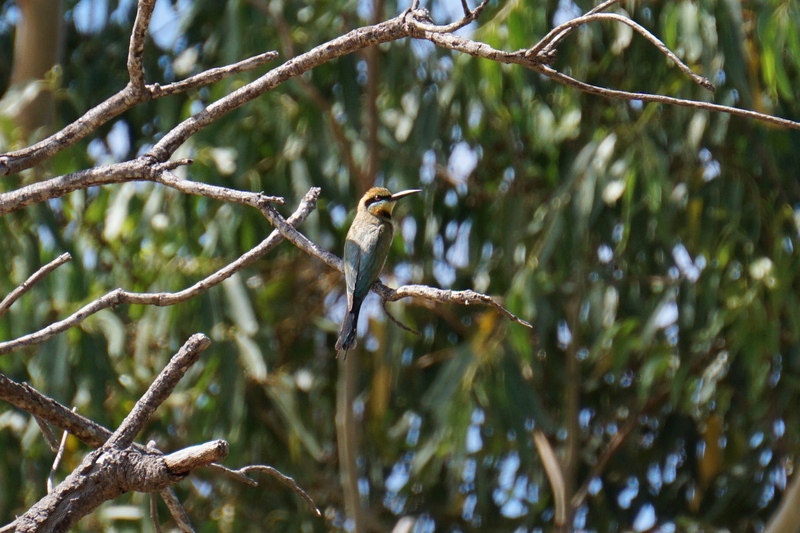 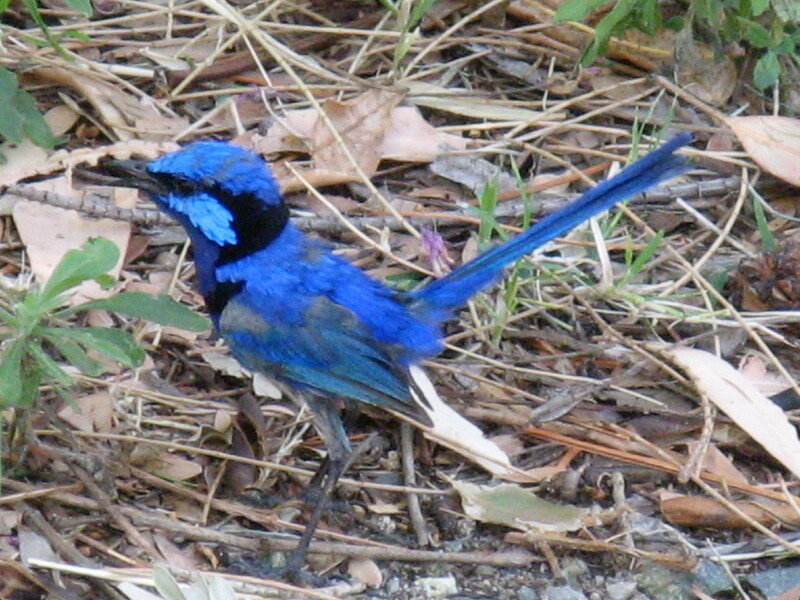 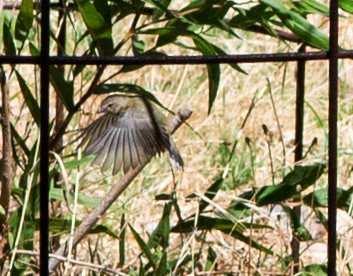 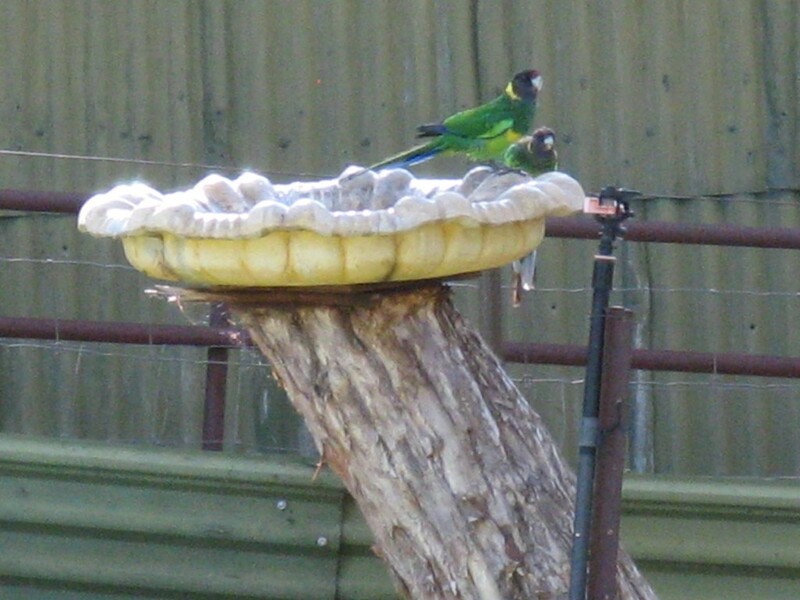 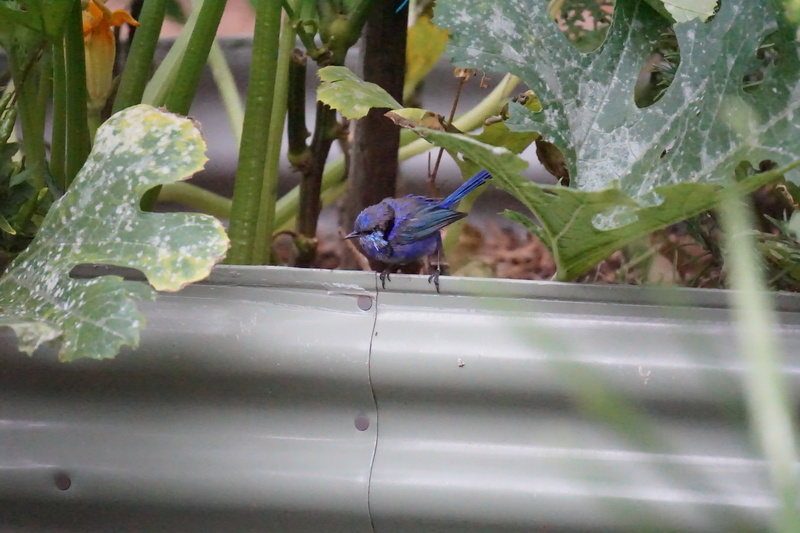 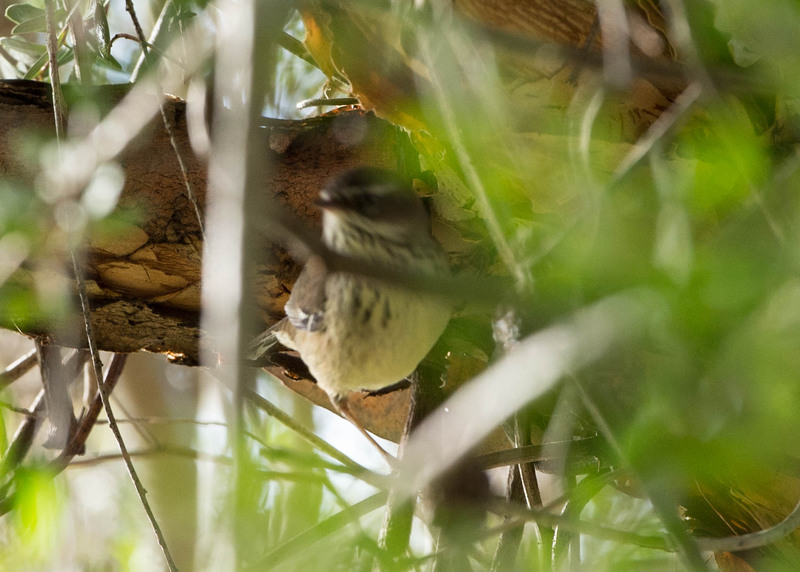 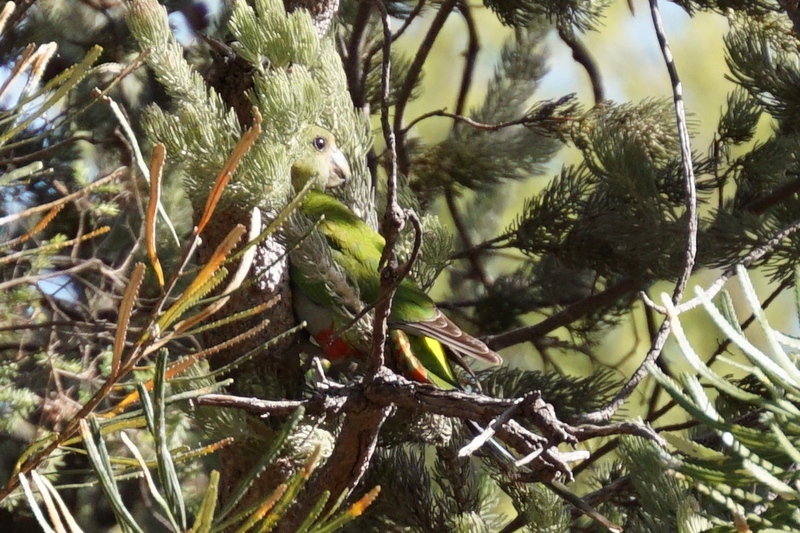 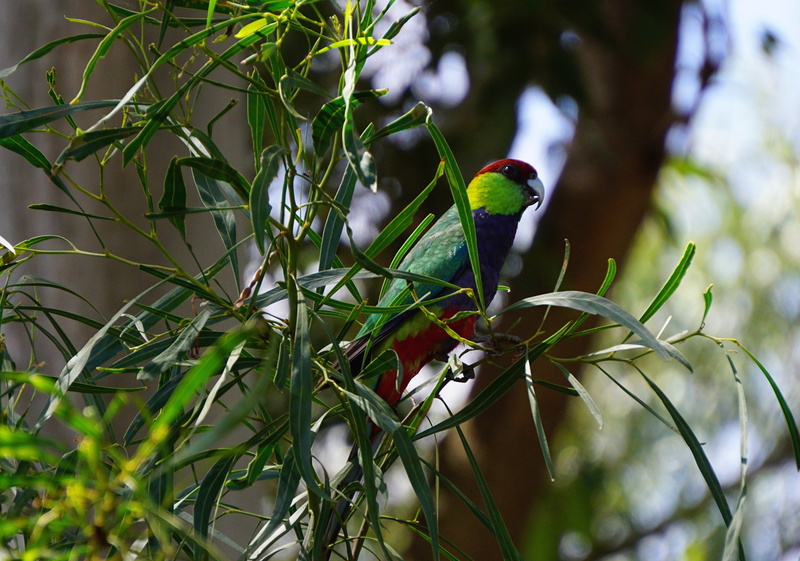 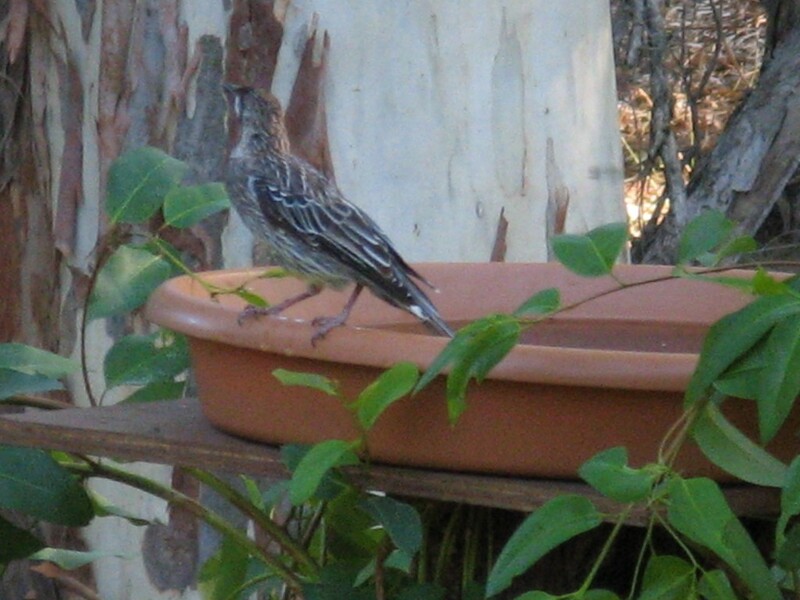 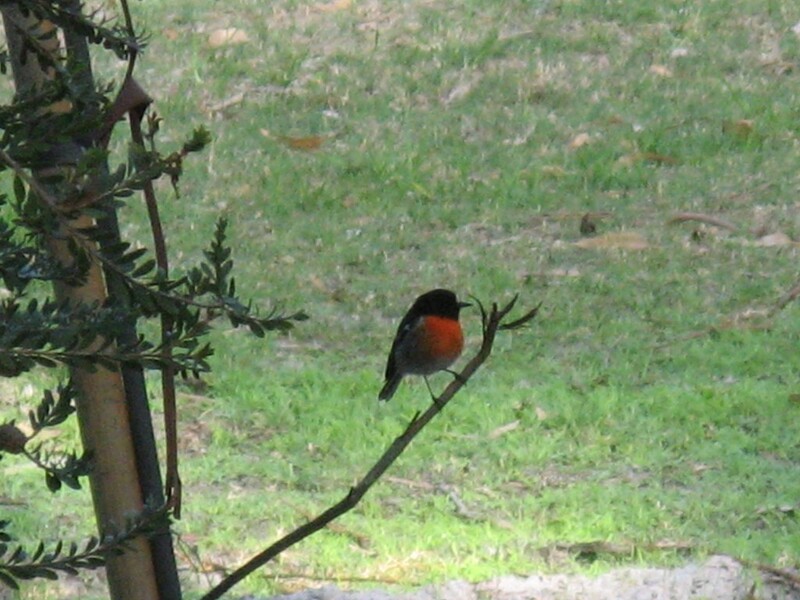 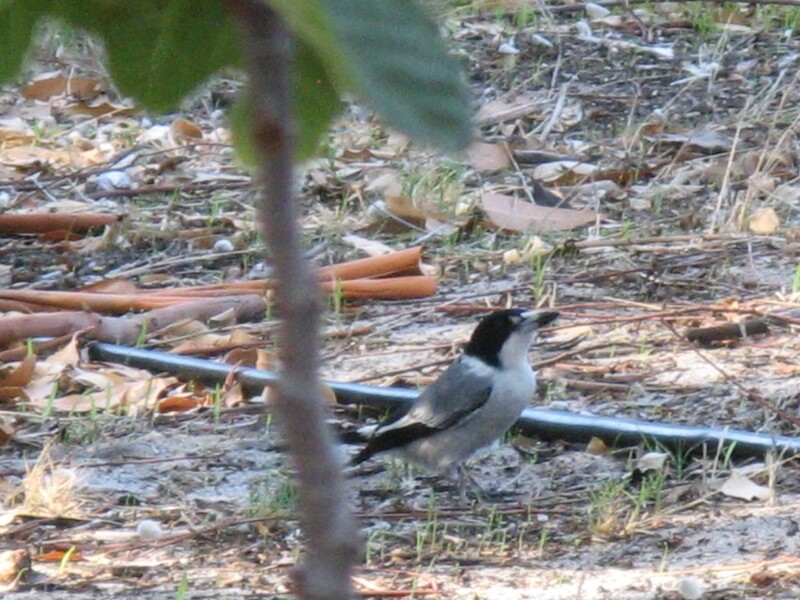 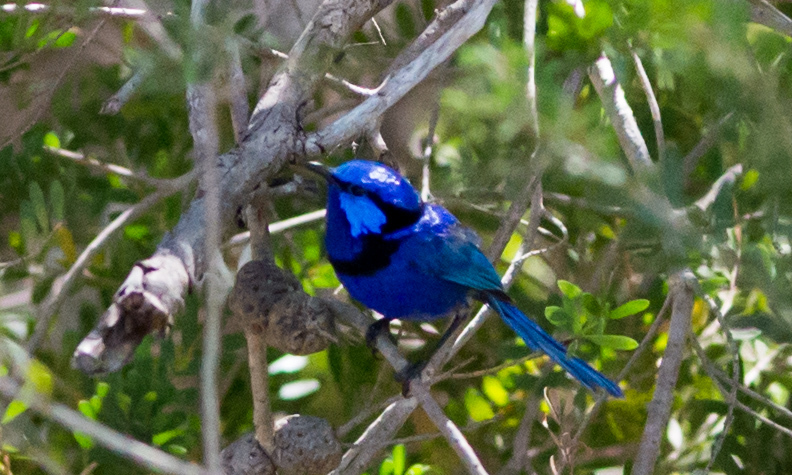 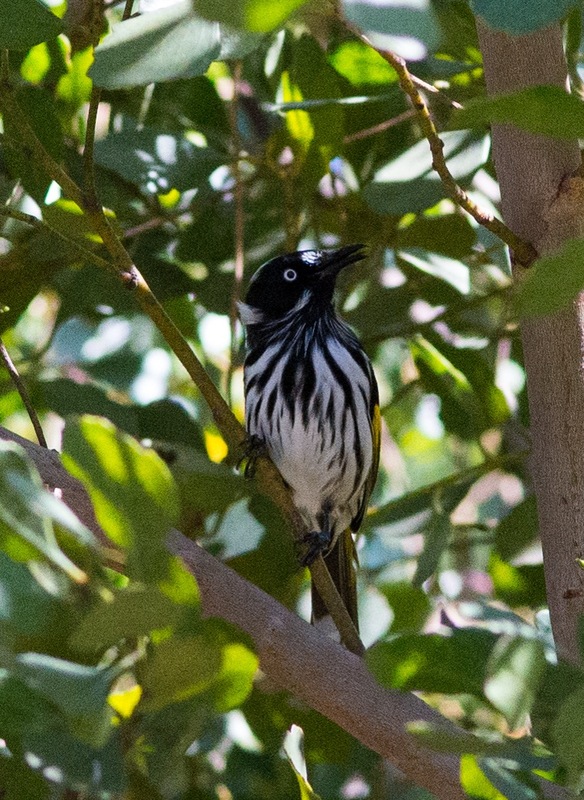 Birds in Backyards is a great site to get more information on many birds found in Australia.